About 7.00 last night John booked our passage, via internet, on the 'Aurora V' Ferry. An early start was needed as the ferry left at 9.30 am. 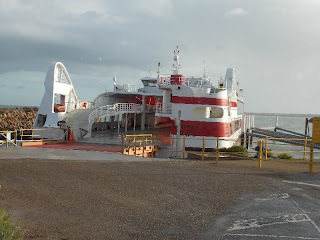 The port is at Wallaroo on the west coast of the Yorke Peninsula. The crossing took approximately 2 hours with the ferry berthing at Lucky Bay near Cowell on the east coast of the Eyre Peninsula. Our rig, EC, had to be tied down because of its height. The crossing was uneventful although a little rocky at times. 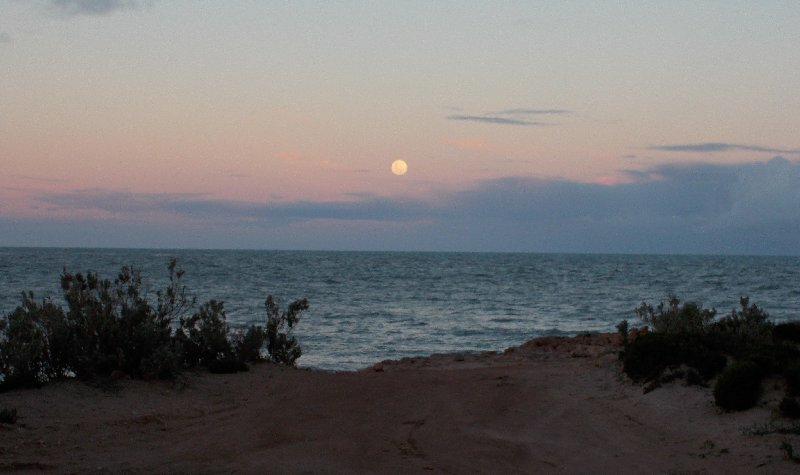 We arrived on the Eyre Peninsula in sunshine which was an encouraging surprise. A camp spot was found at about 3.00 pm. A pleasant change to have relaxing and walking time mid afternoon. Moon rises at sunset over Spencer Gulf.